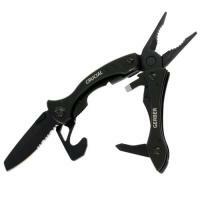 Be prepared for any situation with the Gerber Black Crucial Mult-tool. Built to last, this six-in-one multi-tool features a robust black stainless steel construction that will not fall apart. The long plier handle design provides a sure grip with increased torque, as well as the space required to carry all the tools needed for a day on the job. A 3.5" fine-edge and serrated combo blade provides a versatile cutting tool, while liner locks prevent accidental lacerations and injuries. Engineered to handle a multitude of jobs, this multi-tool includes both flat and Philips head screwdrivers, as well as a razor sharp strap cutter. Under four inches in length and weighing in at only five ounces, the Gerber Crucial Multi-tool truly is a must-have addition to a day in the field.